Along with advancements in computer technology, artificial intelligence, robotics, and even autonomous automobiles, the technology in our workplace is changing at a rapid pace. From yesterday’s monolithic, big software systems that ran your entire business to today’s cloud-based small applications driven by real-time interactions and accessible on our tablets and smartphones, everything seems to be changing overnight. Now, in addition to maintaining your technical know-how, managers and professionals must make certain to remain current with the latest technologies for managing their businesses. This article offers nine tips for managers to keep pace with the new technologies in the marketplace. The volume of data we are able to collect in our organizations is remarkable. In most firms, we capture customer interactions at every possible touch point, including sales, customer service, technical service, and marketing via the web and in response to social media or other promotions activities. Learning to use the latest data analytic software products in their firms to look for trends and spot opportunities. Part and parcel of leveraging data and data analytics tools is the ability to use the growing body of visualization software to make it presentable and easily consumable by users. Leveraging the real-time monitoring capabilities of many marketing automation software products for assessing and adjusting promotions activities. How to take advantage of dashboards and other automated scorecards that measure and report on critical key performance indicators in real time. Many managers are challenged to define their own scorecards and leverage their firm’s software packages to create what is called a dashboard — a visual readout of the situation, often using the red, yellow, green convention of a traffic signal. How to assess the meaning of the data in different systems. For example, today’s sales manager is critically dependent upon the quality and timeliness of the data input by her sales representatives into their sales software system. By learning to monitor and interpret this data, the manager can strengthen forecasting and spot trends as they are emerging. Managers can strengthen their data and related technology skills by exploring the capabilities of their software or regularly exploring industry or professional publications. Additionally, there are a number of organizations dedicated to sharing the latest technology trends as they relate to data for interested professionals. Thanks to advancement in our devices and software platforms, there are many new ways to communicate with team members and colleagues, as long as everyone has an internet connection. 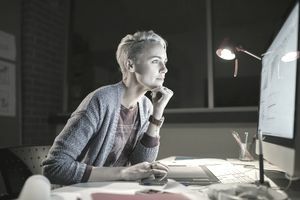 Many software applications and operating systems have built-in chat functions that enable individuals to see who’s online and available to connect. These tools provide instantaneous messaging and many offer the ability to share screens and collaborate. Managers interested in meeting visually with remote team members and colleagues can take advantage of today’s many low-cost and even free video conferencing capabilities. Our smartphones, tablets, and computers all offer some form of this technology. There are remote collaboration tools and document sharing repositories that simplify the sharing and joint development of ideas. In all circumstances before using new technology, managers and employees are encouraged to check with their I.T. departments to discuss any potential security concerns with the applications they are considering using with team members. Remaining current with major advancements in technology is an increasingly important part of a manager’s role today. The best managers are on the lookout for new capabilities that will enable them to serve their customers more effectively and efficiently or improve internal efficiencies and reduce costs. There are a variety of tactics a manager can take to strengthen his/her knowledge. Read publications that focus on how innovative firms are applying new technologies to serve customers, communicate with far-flung employees and innovate. Mainstream business newspapers and periodicals all invest time and space in covering advances in technology. Expand your view. Monitor how leading firms outside your industry are applying new technologies to compete and win. Some of the best ideas for using technology tools in new ways will take place outside the boundaries of your industry. Expand your view some more. Attend industry events outside of your own industry and attend working sessions and visit booths where firms are displaying new technologies. Curate your own content on technology via social media platforms that allow you to choose your interests. The best of these tools constantly stream new content to you via your smartphone, tablet, or computer, offering quick snapshots of articles that you can click on and expand for more detailed consumption. Follow technology and business experts, including experts at The Balance, who are exploring and reporting on the latest trends in their vertical and vocational markets. Ask your customers and business partners what new technologies they are exploring or using in their firms. Visit your counterparts in engineering or research and development and ask them what advances in technology they are monitoring. Take advantage of the training opportunities offered by your firm’s software and technology vendors on their latest releases. Take advantage of every training opportunity offered by your firm on the different technology tools available for employee use. It is easy to lose track of the external world when we are safely tucked behind the walls of our organizations. Many managers develop an insular view, relying on only their colleagues and customers to share insights and ideas. Effective managers recognize the danger of developing a small, narrow view of what is a big, ever-changing world. They take the initiative to pursue many or all of the steps outlined above and they strive to translate their insights and observations into, “What this means for our firm is…,” type analyses. The recent history of business is littered with examples of firms who ignored major changes unfolding in front of them, only to see their business and even entire industries disappear in front of them. It is imperative that you remain current on the latest and greatest new developments in technology and that you work with your team to explore, experiment, and adopt new technologies when they can benefit your business. At some point, everyone changes jobs, whether inside their same firm or outside with a new employer. Employers expect you to be current with technology and capable of quickly leveraging the tools in the new role. Gone are the days when managers could rely on their team members to provide all of the technical skills while they “managed.” Instead, every person on a team, including you as the manager, must be conversant with and capable of leveraging the latest and greatest tools. If you remain unconvinced of the importance of keeping current, know that experts estimate that every 24 months, the technology tools we use in the workplace evolve to the next generation. This means that the training you took just a couple of short years ago is already old news. If you choose to ignore the advances and new capabilities, expect your skills to become obsolete in a relatively short period of time. We live and work in a remarkable period of ever-advancing technology. While these tools are powerful assistants in our drive to manage, lead and compete, the pace with which they change creates stress and more work for everyone. Strive to remain current and not let your skills and knowhow grow old. Your regular diligence in this area, much like regularly attending the gym will pay dividends for you as a manager, your firm and for you in your career.